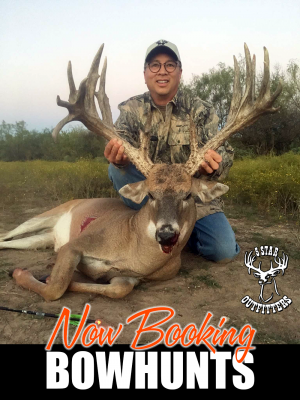 Now Booking Bowhunts for September & October! Now Booking Bowhunts for 2017 Season! First hunt is September 30th! Book now for an ALL-INCLUSIVE, 4 night, 3 day, Guided 1-on-1 bowhunt! Bigger deer available, just ask! Amazing animals, beautiful lodging and delicious chef-prepared meals. Find out why 5 Star Hunters return year after year! To book a hunt, fill out the form below and we will contact you ASAP! !